Kathleen and her husband, Brian, met as volunteers at a camp for adult cancer survivors. Volunteering became a big part of their lives. While children, time, and priorities shifted, they kept trying to find an organization that they could support that would welcome a family of volunteers. A friend of Kathleen’s told her about HOPE, and she explored the organization’s web site. Kathleen was especially drawn to HOPE’s “family friendly” volunteer options, as she was looking for an opportunity to introduce her six year old daughter Cecelia to volunteerism. This mom was struggling with her daughter’s picky eating habits and lack of appreciation at the foods that her parents provided. Kathleen and her daughter began volunteering at HOPE by making lunches on Saturday mornings. Her daughter learned what HOPE is about, and learned that there are children who are hungry, who may not get dinner, or may not get fruit and milk whenever they want it. Last week, four year old Vera began making lunches as HOPE too! This HOPE Hero loves volunteering on Sunday mornings! She enjoys driving into the neighborhoods and hearing the children yell, ”Food truck!”. She also likes dropping off lunches at local churches, beautiful and old churches, where the people are “dressed to the nines” and music is pouring out of the building. 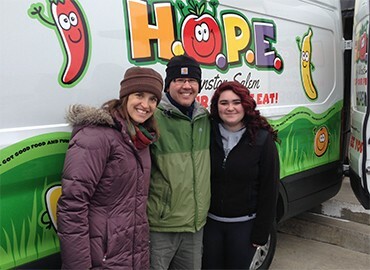 Everyone is happy to see the HOPE van, and Kathleen feels proud and lucky to be associated with the organization.